A former Hollywood screenwriter named Ben Sanderson (Nicholson Cage) is a severe alcoholic and is in a deep depression. After being fired from his job, Ben desires to cash in all his possessions and move to Las Vegas in the hopes that he will drink himself to death. While there, he meets a prostitute named Sera (Elisabeth Shue), who falls in love with him despite his alcoholism and odd behavior. The fact that Nicolas Cage has an Oscar and people like Peter O'Toole, Ian McKellen, Amy Adams, Brad Pitt, Samuel L. Jackson and even Leonardo DiCaprio don't, well, that's just depressing as hell. It might even be sadder than the subject of this movie. 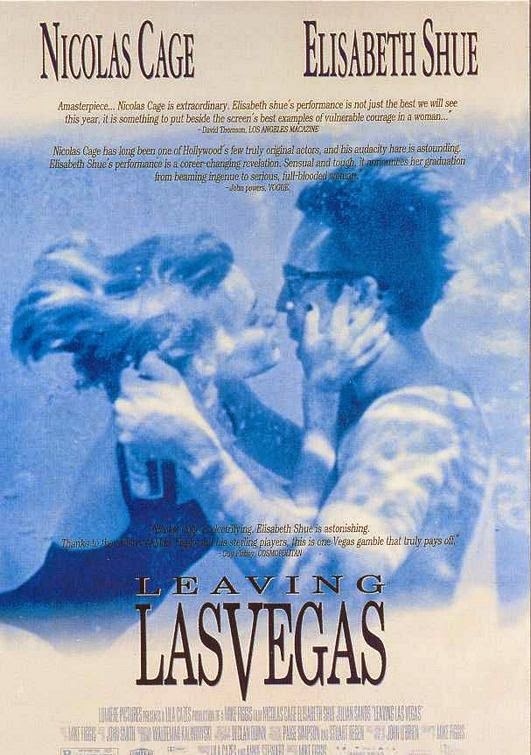 "Leaving Las Vegas" is as depressing a movie as you'll ever find and not one we can watch often. In fact, we'd be happy never watching it again, which isn't to say it's not good, but it speaks to the tone of the film overall. Nicolas Cage's Ben Sanderson, after drinking his way into losing his job, his wife and his son, "moves" to Vegas to drink himself to death. He finds solace in a prostitute named Sera, played by Elisabeth Shue, and they quickly fall in love, despite their pastimes. This premise alone is sad, but when combined with the absolute insanity and desperation on the part of Nicolas Cage, the film's grittiness gets separated from just another movie about suicide. We can see that Ben truly does want to die because he has nothing left, and he figures, what better way to go out with a bang than to slowly but surely drown himself in the sweet nectar of booze, the one thing that never left him, which will be the final nail in his coffin. Nicolas Cage, despite his recent best efforts to take every single movie role handed to him via script and even ones that were probably scribbled on a cocktail napkin from a stranger and passerby, is tremendous in this movie. He plays the deeply despondent and hopeless Ben so extremely well that it makes us wonder if there's something to his bizarre method acting, or if, in fact, you can call what he does acting at all. With a sweaty face while shaking and with his crazy eyes bloodshot, Cages spends 98% of the movie intoxicated and the other 2% either sleeping or screaming at someone. Elisabeth Shue is also great as Sera, a prostitute who falls in love with Ben for exactly who he is and makes no real effort to change his ways. Together, their grim dysfunction is off the charts, as he spends his days and night drinking and she spends her nights hooking until the time when he will eventually, as he hopes, die. Both of these people are so forlorn that they will seek solace in whomever they come across first, but through all of the insanity, the blowjobs and the whiskey, somehow, Ben's last days are spent in the slow glow of the Las Vegas strip in the presence of true love in a poignant but disturbing kind of way. The film itself is a haunting one, but even we can understand the artistry in its sadness. When this is anguish is repeated over and over and compounded by a long run time, though, you definitely might want to make plans to go and have a good, happy time after watching this film. One year ago, we were watching: "The Lego Movie"